My ancestor altar resembles your 2004 altar with the exception I have a large flower vase and candlesticks which belonged to my paternal grandmother. I'm feeling the need to move and reorganize mine, but I want to have it on a western wall if possible which narrows my options. Trying to decide just what photos to place on mine is a struggle. I feel like if I leave someone out they're going to be offended somehow. In comparing the two photos it looks like you've decreased the number of photos to give room for other objects. Are the oracle sets you mentioned only used when consulting with the Dead or do you use them for other divination purposes? Yes Sherri, the pictures change sometimes. I have a core few - my father, my grandmother, grandfather, and great-grandmother, as well as an uncle, that are always there but sometimes I feel the need to add others or give them a break so to speak. I sort of let my intutition guide me, but I understand what you mean about not wanting to leave anyone out. For a long time I included anyone I had pictures of, but overtime I started to feel like certain ones (generally who I had not known in my life) didn't want to be up there, although then I might later feel like they do. 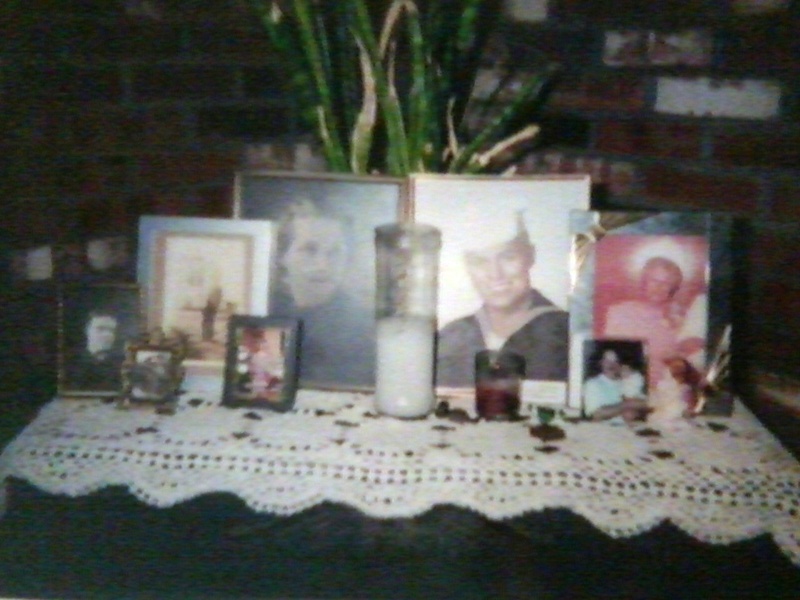 The current altar itself is a desk my grandfather made for me when I was a child so I keep the other pictures in the desk drawer when they feel like they want a break from being on display. The oracle sets are one rune set made of cedar and a Celtic oracle card deck and they are purely for consulting the Dead. 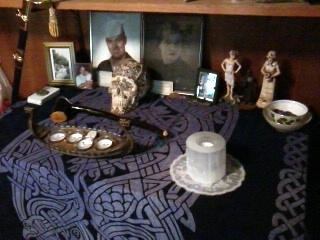 Both oracles stay on the ancestor altar.